AEMC Dealer Distributor PowerPad Model 3945 & more! AEMC PowerPad 3945! Click Here! AEMC PowerPad 8335! Click Here! AEMC PowerPad 8336! Click Here! 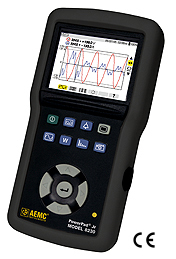 We've just added the AEMC Test & Measurement Instruments to our line of Empower products. First and foremost among AEMC's instruments is the all-NEW! 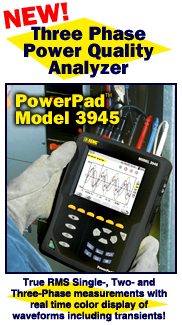 PowerPad Model 3945 Power Quality Analyzer. When we tested the PowerPad 3945 for inclusion in our fleet of three-phase rental units, we went nuts! This True RMS PQ device is, we're happy to say, very easy to use, very easy to view ... and important to almost anybody ... affordable! Right At The 120VAC Outlet! For those single phase power quality measurements that can be made right out of the wall outlet, may we suggest the PQL 100 or PQL 120. This handy unit comes with and is programmed by software similar to that used by the PowerPad 3945. Simply Plug in, Record, Download and Analyze. The PQL meaures numerous electrical and power parameters as well as power quality parameters such as Harmonics, THD, K-Factor ... and more. The PQL automatically captures the worst case Voltage Surge, Sag and THD waveforms, recorded at 128 samples per cycle, ie 16 bit resolution. Up to 12 data channels can be recorded, and the unit is powered right from the outlet it is plugged into. A battey backup assures data integrity during power outages ... for up to a full year! Are we sold on the PowerPad 3945 and the PQL 100 & PQL 120? You bet we are. But if you can't swing a purchase right now, feel free to contact us about renting either one. We'll even apply a portion of the rental fee toward a resulting purchase. Call for spec sheets, catalogs and pricing! very fair & courteous service. You'll be pleasantly surprised! Inc. or AEMC Instruments. Reproduction is prohibited.